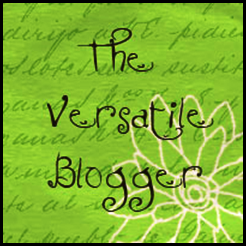 My friend Becky at Academy of the Good Shepherd has awarded me ‘The Versatile Blogger Award’. It’s always a surprise to be awarded an award. a lovely surprise:) Glad to know I must talk about something other than books and building;) Thank you Becky. Thank the person who gave you the award and link back to them. Tell your readers 7 things about yourself. Give this award to 15 recently discovered bloggers. Contact those bloggers and let them in on the news. 1. I always wanted curly hair, alas my hair is dead straight. 2. I’ve travelled within Australia a bit but never internationally. 4. I eat alot of vegetables raw or semi-raw. 5. We’re a blue or green eyed family here, no brown eyes. 6. I grew up on tank water, I’m real good at water conservation. Now the fun part, helping you discover some great blogs, some aren’t really recent discoveries but I want you to discover them:) ‘Sides I’d like to know what they are reading. Hey! Thank you for the award! My kid have actually used a "popper" but we just call it a juicebox. The whole "tank water" things sounds interesting. I bet there is a cultural story there because I am not even sure what it means. son wouldn't have known juice box either, in a large family they get big bottles if at all:) when you live in the country and aren't on a town water supply you have tanks, catch your rain for your water use. Don't people in America have tanks? at least in the country? Thanks so much for the award! As far as the tanks and whether or not we have them in the states, we do have rain catch barrels. But as far as I know we just use them for watering plants. We have well water when you don't have water supply. People have wells dug on their property and that's where they get their water from. Thanks very much for the nomination! I am looking forward to checking out the blogs on your list. I already found Jimmie's blog due to her magnificent Squidoo pages. She is really talented. Thanks so much for the award, Erin! And thank you for your lovely comment in my little land of words too. It's always interesting to meet up with people via our blogworlds and discover how many ways we are alike and connected. I love that, and I'm very glad to meet you! I so enjoyed awarding all, just wanted you to know I enjoy reading what you have to say.